Christmas has come and gone and you're probably thinking who on earth a) still has money to buy anything and b) cares about car chargers enough to purchase one right now. But you'd be wrong. One, because many of you may have long car rides ahead of them on New Year's Eve or a day or two after, and two, because you've probably spent a lot of money purchasing gifts that you'd appreciate a nifty discount on an item that you already wanted to buy. 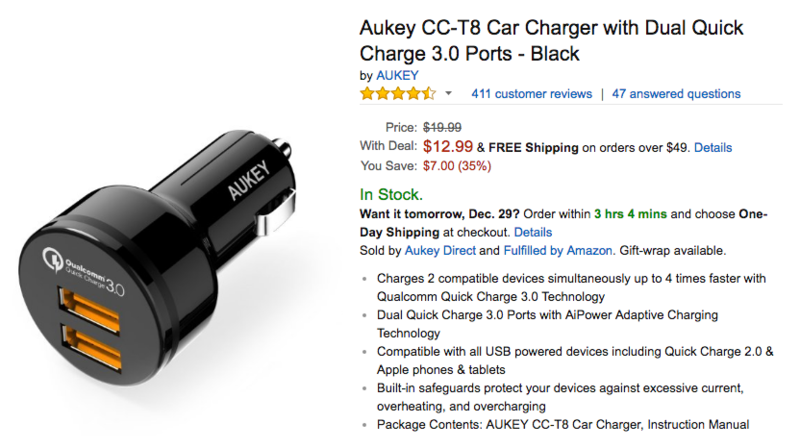 So this is the deal: the Aukey CC-T8 car charger is now down to $12.99 on Amazon. This is the one that has two QC3.0 ports and not just one regular port and one QC3.0 like the other charger we told you about a few days ago. The CC-T8 normally goes for around $20 — or so CamelCamelCamel tells me — and the last time it was discounted, you could get it at $14.99 but you needed to use a coupon code. Now it's $12.99, no coupon required. Shipping is free with Amazon Prime unless you opt for the faster delivery methods, then you may need to pony up a few more bucks. The link to purchase it is below.